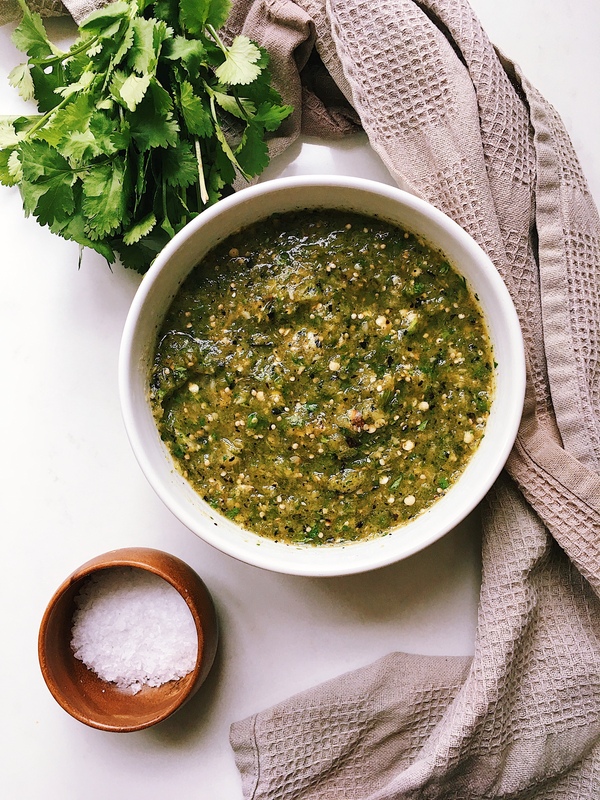 A taco would not be a taco without a good spicy salsa and this charred tomatillo salsa is the best! Heat an old frying pan or a flat griddle at high heat. Place the tomatillos, onion, jalapeños and garlic with skin on the hot flat griddle. Make sure to turn them around to char them evenly. The garlic will take around 5 min to cook. Take it off and set aside. Once all the veggies are charred. Mash them on a molcajete or use a blender. If you use a blender, use the pulse option to get a chunky consistency. Add salt and coriander and give a quick pulse. Use some water if needed. The salsa has to be a bit runny. Perfect with some totopos (tortilla chips), tacos or with anything you fancy.